TravelMarx: Dactylopius - Got Cactus? Left: Dactylopius – Spelled in Dactylopius; Right: The Painted Cactus? Is this is getting to be an annual affair? The Las Vegas Painted Cactus celebration? Or, the Dactylopius Derby? 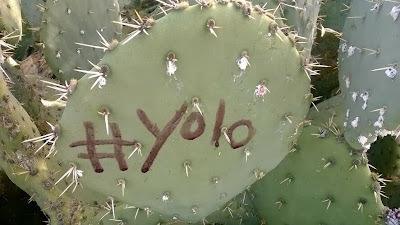 Last year’s Opuntia-painting (Binomen Art –Dactylopius) was largely gone color wise, but the impressions were still visible on the cactus pads. We repainted, enlisting nieces who were a little a squeamish in the smooshing of the scale insects to get our “paint”. 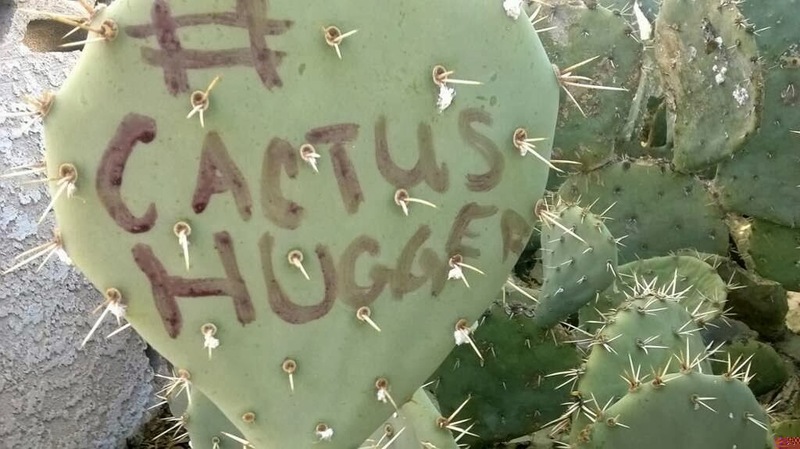 They quickly got over it as silliness took over inventing phrases and possible hashtags: “got cactus?”, “I am cacti”, “#savethecacti”, “#cactushugger”, “#yolo”, and “#paintthecactus”.